Who knew a musical based on the fantastical tales of Dr. Seuss could be such a delight? First seen on Broadway in 2000, Lynn Ahrens and Stephen Flaherty’s Seussical is a warm and fuzzy musical adaptation of children’s author Dr. Seuss’s most beloved stories, narrated by none other than The Cat In The Hat. In the Jungle of Nool, Horton the Elephant finds a clover inhabited by an entire city of microscopic beings called Whos. The only problem is, none of his neighbours can hear the tiny people, which leads to trouble for both Horton and his miniscule new friends. 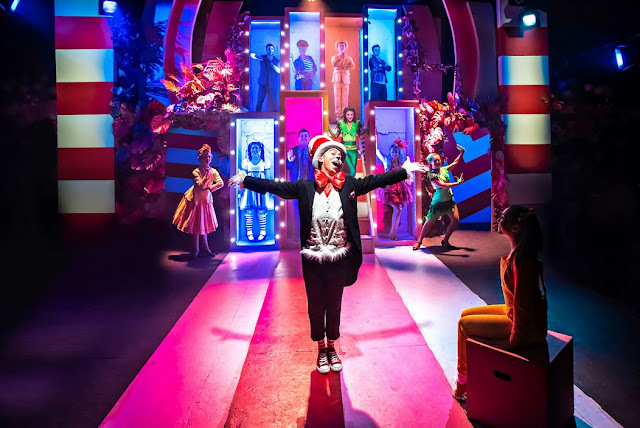 James Tobias directs this charming production at the Southwark Playhouse, which evokes a sense of childlike wonder and joy at every turn. Running at a youngster friendly 75 minutes, it’s a fast paced frolic with a heart of gold, set within a candy striped, and kaleidoscopically lit world. 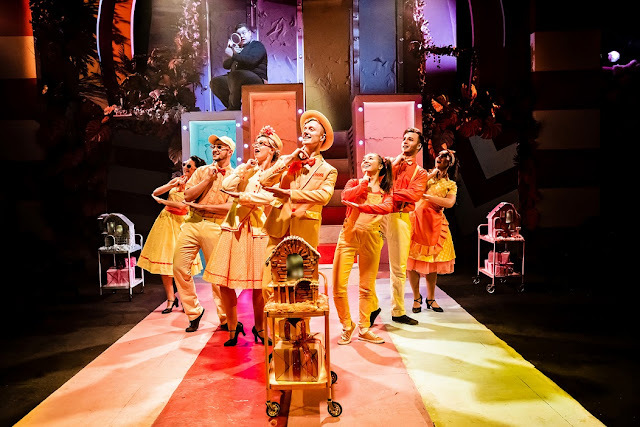 The music is relentlessly cheery, with groovy earworm Oh The Thinks You Can Think setting the tone for the whole musical; snappy, if simplistic (and often purposefully nonsensical) lyrics, a bouncy tune, and tight vocals from the excitable ensemble cast. Combined with Chris Whittaker’s frenzied choreography, the number explodes into the audience just as Doctor Seuss' writing leaps of the page. Marc Pickering is a cartoon come to life as The Cat In The Hat, showing an excellent rapport with audiences of all ages and he bounds around the stage. Scott Paige is a lovable Horton and Amy Perry is brilliant as Gertrude McFuzz, Horton’s besotted next door neighbour. Meanwhile Adam Dawson and Daisy Steere are a kooky couple as the Mayor and Mayoress of Whoville, amusingly waspish despite their sunshine yellow attire and quirky mannerisms. This family friendly version may be a tad short, and a bit too busy at times, but all in all Seussical is a high spirited musical, with morals to teach audiences of all ages. Family shows don’t get much more entertaining than this.